I Helped Cause the U.S. Job Loss Problem : Executive Leader Coach @ dbkAssociates, Inc.
And I’m not feeling at all guilty about it. For more than 3 decades, I spent my professional career in the semiconductor business. I worked for large, state-of-the-art semiconductor manufacturers. Arguably, semiconductor product development, specifically Integrated Circuits (IC), is what has driven the technology advances that have enabled job loss in the manufacturing sector. In fact, technology aided and abetted the ability to offshore labor as well as automate here at home. So, I have contributed to the job loss problem we have today. Presently, as I work with business leaders and entrepreneurs, I extol the virtues of automation. I believe that as long as we must play by the rules of the capitalist game, we must do what we can to minimize the costs of manufacturing. By far, labor is one of the most significant costs of production. When our executive peer advisory board is working on an issue, we remind ourselves that the issue that gets named is the issue that gets “solved.” So we work hard to make sure we state clearly what the issue is we want to address for our colleague. 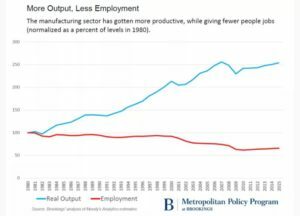 When it comes to manufacturing in the U.S., we are often told that “we do not manufacture here any longer.” Manufacturing has left the U.S. according to many pundits. They blame offshoring of jobs in pursuit of low paying labor. Certainly, there is some truth in that statement. What do we expect? We demand that public companies maximize shareholder value, and that of course means minimizing costs, which of course means reducing the cost of labor—DUH! Now, even China is losing manufacturing jobs to other lower labor cost countries. Offshoring has been a wonderful thing for those countries successfully bidding on our contract manufacturing needs. Many, many folks were lifted out of poverty because they were able to find work where none existed before. In addition, consumers here in the U.S. have been able to purchase low cost products which has been a boon to helping maintain at least some semblance of a good standard of living. If we misstate the issue, we will solve the wrong problem. Manufacturing jobs are not coming back to the U.S. in any significant quantity—despite all hyperbolic statements to the contrary. Those comments are not based in any kind of understanding of global economic reality. Oh, I expect politicians to crow about 500 jobs here and a thousand jobs there, but—HELLO!—we “need” 120k jobs per month to take care of those entering the job market. 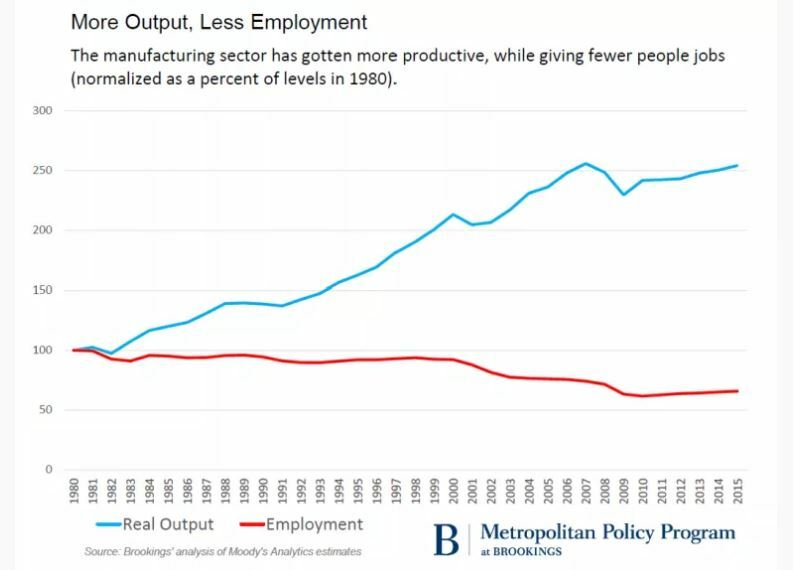 Manufacturing isn’t going to be the source of those jobs. Think Gig Economy. Look at that chart again. Massive production with fewer and fewer employees. Also, think agriculture. We’ve been here at the massive job loss economy before. It used to be that a majority of our citizens were farm workers. Now we have less than 2% of our population working in agriculture. And we’re feeding a huge number of people. Some might argue that we are feeding a significant portion of the world, not just our own people. That progress is due to technology. Here’s the rub though. It took a long while to get through the transition. And farm hands had a “ready-made” place to go—they went to the factory and to urban retail businesses. Change was slow back then. People had time to react. Change now moves at the speed of the internet. And, there isn’t a ready-made place for the obsolete factory worker to go. It takes a big change in education level to move a worker from, say, the automotive production line to programming and maintaining the robots that obsoleted that worker. 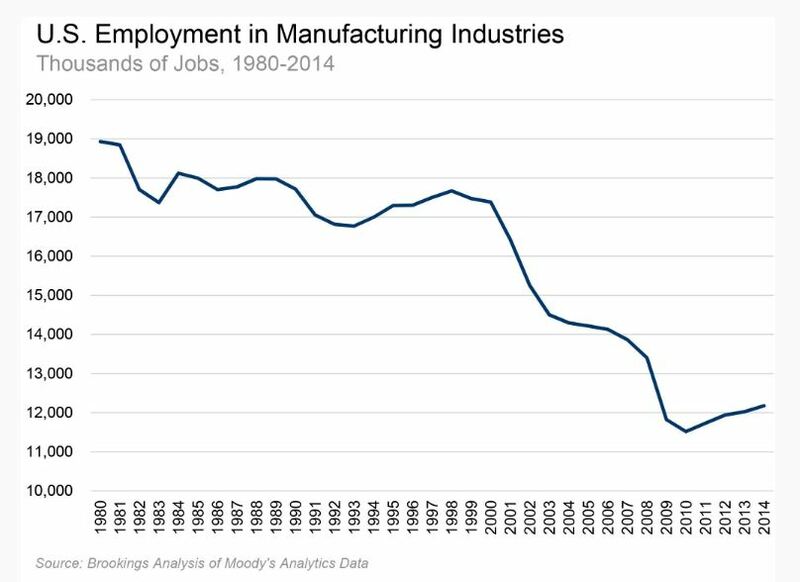 High manufacturing employment is a thing of the past. To be competitive in the global market—it isn’t going away no matter how hard we might wish that it would—we will have no choice but to continue to automate wherever and whenever we can. As we mistakenly fight to raise wages for labor, we will only cause automation to accelerate. The conclusion I draw is that we cannot solve our problems by going backwards. As stated above, our manufacturing jobs are leveraged 5 to 1 from when we started embracing automation and low cost labor. Barking up the “bring back manufacturing back” tree will lead nowhere. It’s the wrong tree! We need to be working on how to take advantage of the almost negligible cost of manufacturing, achieved with almost no human labor. How do we share in that dawning miracle? How do we make sure that more than just a very few benefit from that severe job loss? That is the issue to solve. Don’t be fooled by those who either are ignorant or charlatans. Both political parties have been harping on the need to bring manufacturing jobs back to the U.S. I’ll say it again—that isn’t going to happen to any significant degree. We must work to find a solution other than manufacturing jobs to ensure a decent standard of living for our citizens. Any ideas? Are you capable of new thinking on this job loss topic? Can we continue to be an economy based on consumption? How do we measure contentment and standard of living? What examples are there from other countries that seem to have solved this problem? Are we mature enough to learn from others and embrace solutions not invented here? Terrific article, and I hope the blatherers who tout for our votes read it. Thanks Allen. It is definitely frustrating to watch a train wreck unfold. Thanks MU! Progress is often spotty – but it is relentless. Resistance is futile!